More than 180 million Americans have a problem with their vision. Most believe there's not much they can do on their own to change how much (or how little) they see. Now there is hope. In the past decade, an overwhelming number of clinical studies have shown that eating specific nutrients can help maintain vision well into old age, alleviate eye conditions, and even reverse the progress of diseases. 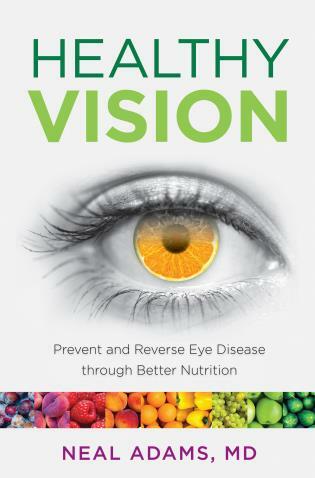 In this book, top ophthalmologist Dr. Neal Adams uses clear, accessible language to translate research from hundreds of clinical studies in ophthalmology and nutrition to show how we can restore and maintain eyesight by changing our diet. The solution is simple: just naturally grown foods, with nutrients clinically proven to target the components of the eye affected by disease and/or age. The book explains how the eye functions and what nutrients influence these physiological processes, and includes tailored, easy-to-understand instruction on which foods and nutrients will target the reader's specific concerns. Particularly helpful for the 150 million Americans who visit their eye doctors annually as well as the 95 percent of Americans over 40 at risk for future vision loss. Neal A. Adams, M.D. is a leading expert in ophthalmology, and one of only 2,500 ophthalmologists in the country who perform surgery in the front and back of the eye. Formerly Chief of the Division of Visual Physiology at the Wilmer Eye Institute of the Johns Hopkins Hospital, Dr. Adams recently left his position as Chair of the Department of Ophthalmology at the Paul L. Foster School of Medicine at Texas Tech University to open his own clinical practice in suburban DC. His practice now focuses on providing patients with surgical and nutrition-based care. Dr. Adams has appeared on local ABC, CBS and Fox News programs, as well as in The Washington Post, The New York Times, and The Boston Globe, to provide expert analysis on ophthalmic medical research. Adams has also appeared in US News & World Report's Good Vision Guide, and serves as Editor-in-Chief of the leading peer-reviewed medical journal in his specialty, Eye Reports. Dr. Adams has received many honors as a highly skilled surgeon, clinician, academician, and researcher. A graduate of Yale University and Johns Hopkins University School of Medicine, Dr. Adams lives with his wife and children near Baltimore, Maryland. ** Appearances on local ABC, CBS, Fox News programs, The Washington Post, The New York Times, and The Boston Globe.